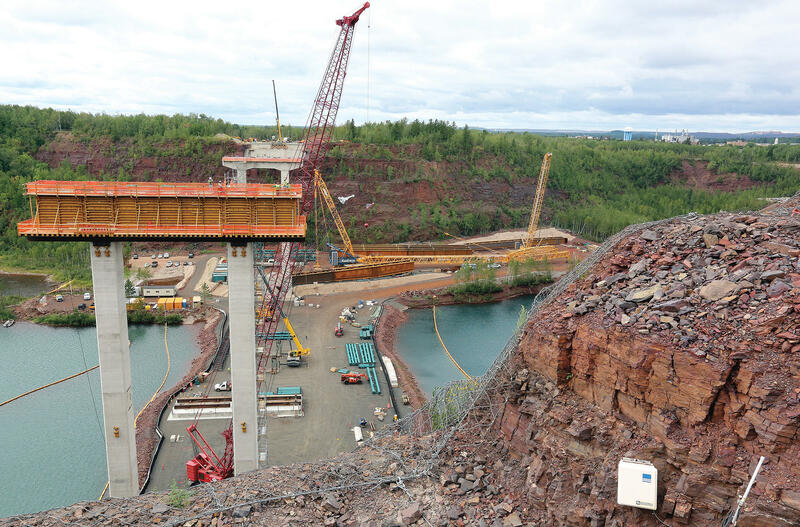 The Duluth News Tribune reports, the temporarily home to one of the largest cranes in the world, the U.S. Highway 53 relocation project outside Virginia, MN is nearing a year-end milestone on its way toward completion in fall 2017. 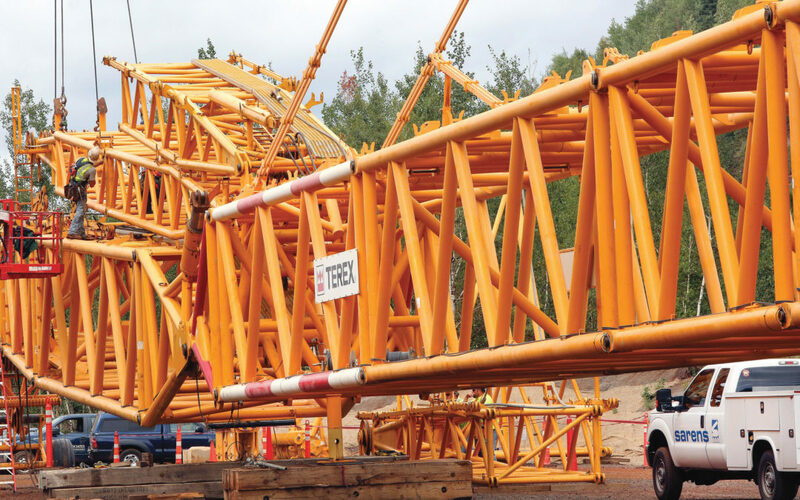 Requiring 52 truckloads to deliver from New Orleans, the 1375-ton (US) Terex Demag CC-6800 Crawler Crane is among the top five lifters in the country, according to crane owner Sarens, a worldwide company that specializes in heavy lifting. 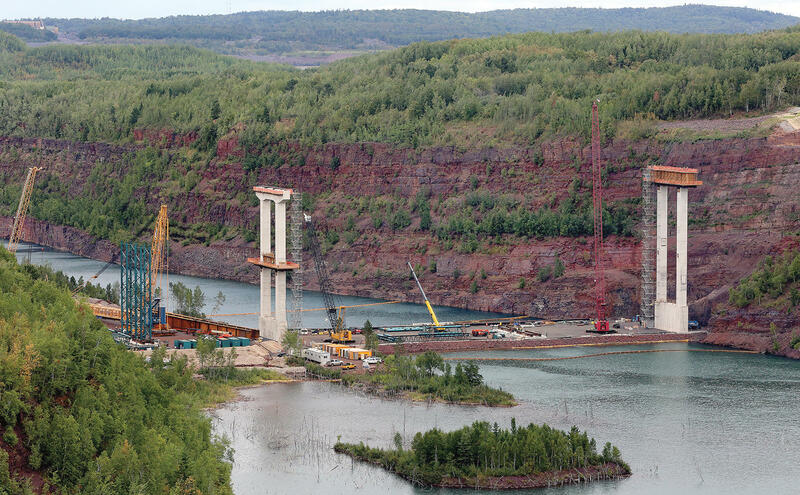 The crane has been built and is positioned on the causeway at the bottom of the Rouchleau Pit — poised to raise 750,000-pound partial lengths of steel girders that will make up the horizontal supports for the bridge centerpiece of a $230 million project. The relocation of Highway 53 was necessitated when mining interests notified MnDOT that the road would need to be moved in 2010; construction began earlier this year. The main contractor, Kiewit Corporation of Omaha, Neb., and its subcontractors are in the process of pouring concrete to form the cross braces of the two existing bridge piers and have assembled temporary towers for use during the upcoming placement of girders. 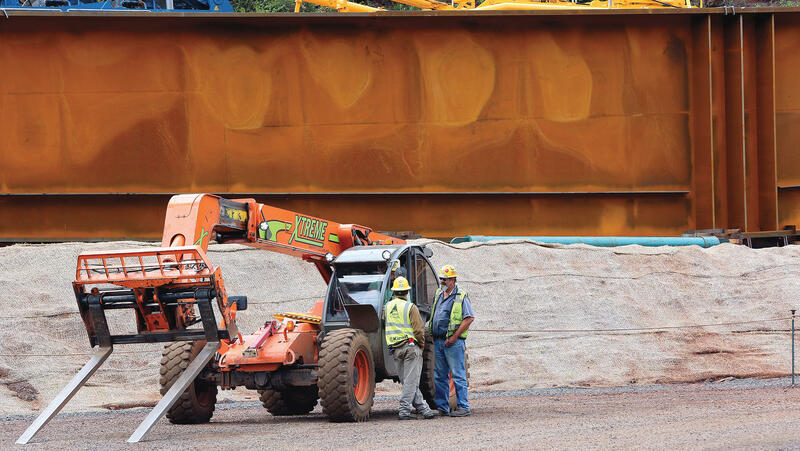 “We’re kind of in a race to get (pouring) done on the near pier and west abutment, so we can start putting steel girders in the air in mid-September,” Huston said. Girders are being bolted together in sections on the ground, giving rigidity to the sections that will be hoisted into place by the crane. 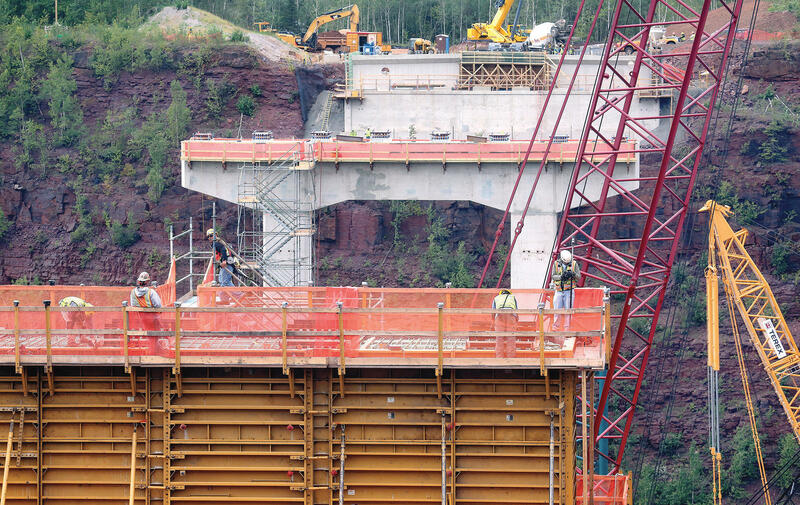 The plan is to have 80 total girders in place across the 1,125-foot span before the ground freezes so that concrete pours on the deck of the bridge can begin in the spring. 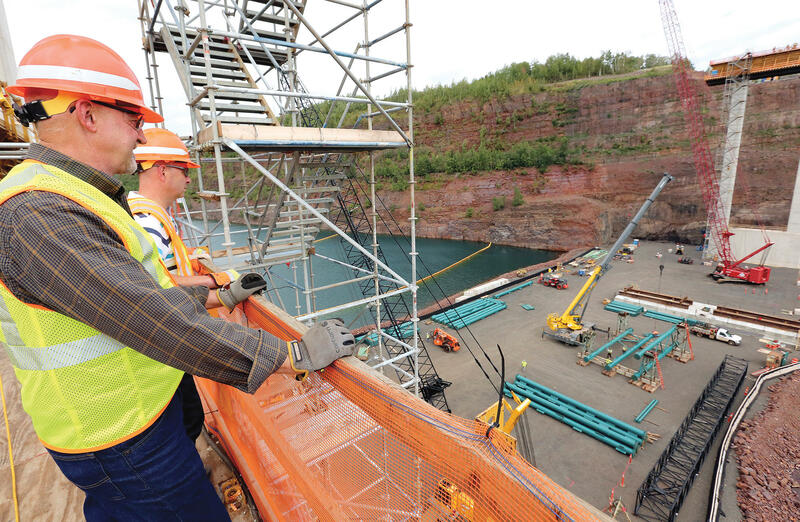 Every two weeks, Virginia Mayor Larry Cuffee Jr. is visiting the project, which includes more than 3 miles of roadway bending north of Eveleth before descending across the pit and into Virginia and a new intersection at Second Avenue. While the project is on target for primary completion next fall, it has experienced some cost overruns, to which Cuffee has been particularly keen. Largely funded by the state, the city was granted $13 million in state bonding money in 2014 to cover the installation of new water and storm and sanitary sewer lines that are buried along the roadway and will be hung under the new bridge. 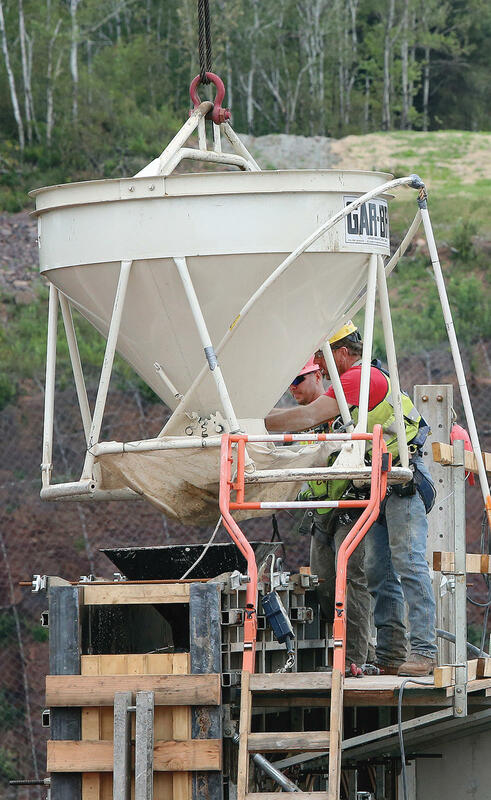 Cuffee said the city is facing a funding gap that’s growing toward $5 million as the project has experienced unforeseen challenges — having to blast more rock than expected while also experiencing more toxic soil abatement than anticipated. Cuffee said the city did its due diligence by asking for state bonding worth $11 million plus $2 million in contingency in 2014. A state legislative session that passed without a bonding bill in 2016 will force the city to take out additional loans to cover cost overruns. In a contradiction between state practice and construction progress, Cuffee explained that the city has to pay for construction work up front using loan dollars, while the state’s Department of Employment and Economic Development doesn’t reimburse the city with bonding funds until the work is complete. Overruns will be paid for with borrowed money, too, and Cuffee said he hopes the next state bonding opportunity will allow the city to recoup overrun costs. All things considered, he’s pleased with the progress and doesn’t fault MnDOT or the contractors for unforeseen challenges like finding the buried foundations of railyard buildings to include more widespread asbestos and other contaminants than anticipated. Also, even advanced bore testing, Cuffee said, couldn’t uncover every rock formation that has required more blasting than the project originally planned to have. Crews continue the reconstruction of southbound Highway 53 from Vermillion Drive to the eastbound ramp to Highway 135. There is one lane of traffic in each direction while crews rebuild the southbound roadway. The work will take about two months. Next year, crews will rebuild the northbound side of Highway 53 in that area. Project officials urge motorists to use the zipper merge to minimize backups near the work zone. — On Sept. 1, MnDOT will conduct its monthly Coffee and Conversation to provide updates on the project to the public. It will take place at 10 a.m. at the MnDOT headquarters in Virginia at 101 N. Hoover Road. — For more information on the project, visit the project website atwww.mndot.gov\hwy53relocation. Viewers will also find access to the project’s web cam, as well as new photos of the project on that website.